I’m definitely not a fan of the ‘cut the daily latte out of your budget and you will save 1000s of dollars a year’ advice, (after all, are any of you buying daily lattes? I’m not) but even so, there are savings to be made by re-examining things just a tiny bit. If I examine my daily routine, I can see that there are 4 main areas in which I can tweak my routine ever so slightly- saving money and being more frugal in the process. For example, if I serve even half a cup less of food on everybody’s plate (across all the different items served), no one really notices the difference in serving sizes yet there is then enough for an extra leftover meal. In fact, I’ve even started using measuring cups as serving spoons, and now I know more accurately the amount of food that is going to feed each person. By cooking the same amounts of food, but serving less, I feed one more person, one more time. In other words, from an amount of food that would feed us dinner, I now get dinner and a leftover lunch. Not only is it healthier to eat less, but that’s a potential savings of â‚¬2.00 per meal (the average dinner chez nous costs â‚¬10 to buy and prepare), saving us hundreds of euros each year. There are some things that it doesn’t really pay to buy full price, so I don’t. Cat litter, frozen vegetables and so on fall into this category. About two years ago I made the discovery that I, a self-confessed coffee addict, could drink the store brand coffee instead of the nice stuff. That was a major breakthrough, as the difference in price is quite substantial. Lots of other things can be bought generic, or on price alone. The lower quality product does just a good a job as the higher end, although your tolerance for lower quality may differ from mine. Have you tried driving a different way to work? What about trying a different mode of transport? Using your time more wisely can help save you money. For example, I often take the tram to school. It takes about the same time as driving, and costs about the same amount for a tram ticket as gas, but I can use the time to study, instead of thumping the steering wheel in frustration and shaking my fist at the other drivers. Here’s another way to tweak the way you use time in order to gain some savings: try stretching out the time in between when you repeat tasks. If you wash your hair daily, try washing every other day (this is especially good if you can’t, or don’t want to, switch to a generic shampoo). If you go grocery shopping every seven days, try going every eight days and so on and so forth. Do you use store advantage cards? Clip coupons? What about paying full price for clothes, or maybe buying them at thrift stores. What kind of interest or penalties are associated with your checking or savings accounts? 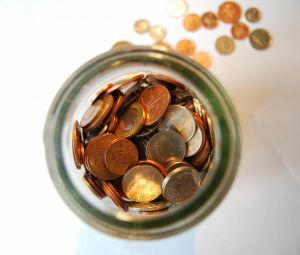 Sometimes a small change in habits, or a transfer from one account to another can save you (or earn you) lots of money. I recently received an offer from ING, where I have my savings account. If I deposited any amount of money, the interest rate on the account would be raised to 8% during three months. What a deal for very little effort! How can you frugalize your routine? What changes have you made that have saved you money? Wow, I never thought of measuring servings at dinner! That is a genius idea. My husband and I are currently already working on eating smaller servings from the perspective of dieting, but your perspective is also one to be considered!! We have taken to measuring our portions as well because we wanted to loose a few pounds after the holidays. It does make a difference though as we usually get can 1 or 2 lunches out of dinner as well. Also, under the category of quality…..many of the generic or house brands are made by the high end price companies. The only thing that changes is the name brand and packaging so low price doesn't necessarily mean lower quality. I am actually still in the "don't buy lattes, make coffee at home" camp, sadly. But everybody has to start somewhere. The biggest frugal thing I've done, though, is learn to make my own fancy bath products. Lush was a huge indulgence of mine, and I was taking $5 baths several times a week. Now I make my own stuff, it's better for my skin, and it's far, far cheaper. I have been doing a better job at eating smaller portions, but I love to eat so its difficult. If I can have one meal a week that's a leftover, that's a very good start. We are trying to really cut down on our eating out. After church we like to go out to a fast food place with friends. Lately we've been trying to cut down. There are ways to socialize with your friends without spending lots of money. I like to portion out our food so that I can get two meals out of it. If anyone is still hungry they can fill up on vegetables or fruit or something. I serve what is supposed to be a proper portion so that's usually enough. I find reading "frugal" blogs makes me think more about what I do every day. This has made me cut down a lot on expensive ingredients. And like you, I also freeze extra dinner portions ahead of the dreaded "I'm too tired to cook let's get a take-away instead" syndrome. I feel so virtuous when I can go to the freezer and save the spending of £10 just like that. And I started a new habit this month. Encouraged by some blog reading I now draw cash from the machine outside the supermarket….just the amount I am allowing myself for the week, and then going in and doing my shopping and paying for it cash. I cannot explain why this works but I do spend a whole lot less than when I paid with cheques or plastic. I seem to run a total in my head around the shop rather than just chucking stuff in the trolley as I go. And we have soups every day from very little in the way of "new" food. I use up veg from the freezer, stock from cooking other meals, and a handful of lentils. Soup is more filling than almost anything else…..
For a very frugal person like myself most frugal tips are going to be stuff I already do. That said there are still areas where I could be more frugal. We started cutting back on our eating out last spring. One new thing that I am doing to frugalize my daily routine is use natural light when I house clean. I open every curtain as soon as the sun is over the mountains, and do not turn on any light switches until close to sundown. Not using the energy helps our electric cost, plus the sunshine helps to brighten my mood. I take advantage of most of these suggestions as well. I like the idea of measuring the portion sizes, although I am relatively careful about that as it is – but I hate seeing food go to waste. I try to make dishes based on what needs to be eaten in the fridge and recently, I've been freezing any veggies that are about to turn, to use for later use in soups. I just read a good tip – roll your coins more frequently to start earning interest on them now, rather than later! I've been doing your first tip, not only for food but for all consumables. If you are washing clothes, use less than the recommended amount. You won't notice a difference in your clothes and your bottle will last longer. Recipe calls for 1/2 cup of parm? Use a heaping 1/4 cup! Every little you save, especially in situations like this where you won't notice having used smaller amounts, helps financially and environmentally. I think the latte example is still a good example for some, simply because there are those who are addicted to Starbucks and must have their lattes. It’s also one of the easier steps to take when starting a frugal journey. Of course, I don’t drink coffee so I was fortunate in that department. I need to get into a better habit of measuring out food, particularly when I stop with Nutrisystem. I like the idea of using measuring cups…I’ve been dreading the idea of buying the scales. That’s just a lot of clutter for my tiny kitchen. I agree with Nancy, lower price doesn’t necessarily mean lower quality. But, I do pay full price for cat litter. I personally like Fresh Step the best and don’t use anything else. My cats won’t either. But, I like the paw points program as I can get discount coupons and free boxes of litter out of the deal. I think I could definitely get better with the whole clipping coupons thing too, but I often find that most of the coupons are for things I don’t even use. I’ve looked into the coupon game as an option, as well, but that seems like a lot of work to me, so I don’t know. My biggest routine challenge is pulling into the fast food drive-through after a long day’s work. I need to get better about saying no to myself on that. Hi Kelly! I love the 4 categories- I linked to this article today in my roundup. Like Sharon, I use 1/4 c of laundry detergent for lightly soiled loads. You only need the 1/2 cup recommended if your kids (or you and your spouse) have been out playing in the mud. I love the break down in the post – I linked here from Homemaker Barbi. We are also stocking up on home made items. We bake our bread, grow many of our own vegetables, can items, and this year are looking at building a small green house to get vegetables during the winter. We are experimenting with vegetarian recipes. I like my meat but for health reasons as well as saving money, we are learning more about using lentils, beans, etc to make healthier inexpensive meals. Kelly´s last blog post..did you know that February is national hot breakfast month? These are good tips. You must have a large family if it’s 10 euros for dinner. I would add buying in bulk if you can. We have a Metro here which is akin to a Sam’s Club or Costco in the US. It leads to major savings if you can find one. Living frugally is your insurance for your budget. This is the second time I’ve visited your site – I really like it and the good tips…and your insite about living in France. I am German who is living in Spain but came here by way of Belgium. Anyway, I just wanted to comment on your idea about serving with measuring cups. If you take the time to measure out your usual serving spoons that you use, you will be more aware of the tools you already have. i.e. the average soup ladle holds about a cup, average serving spoon about half a cup and so on. This is good training for the ‘eye-measure’. Yeah the whole martyr business of budgeting is so annoying. Like you said, some things you cut and you don’t notice. Looking at it that way, it’s more like a game. :^) You’re so good Kelly! … and lots of other stuff too. I did enough to be able to work a 4 day week and not notice any financial difference … except that I was also saving more!!! One of my personal commitments to my kitchen is to avoid waste. For me this means using up what I have in the refrigerator already before buying more and I am slowly working thru my small trunk freezer. So I take things out the night before or early morning and a little leftover veg/broth/tomato sauce gets turned into a soup, pureed or not. A little left over meat may get cubed and added. I am also getting inventive with the excess of leftover stale bread thanks to my husband who is a bread eater. The baguettes/or similar dry out very quickly within a day. So I make him freeze half and eat the second half or else he's eating a lot of croutons in his soup! Through all this, for once I have an uncluttered refrigerator and nothing goes off. No more forgotten vegetables in the bottom bin anymore! I think you have an excellent blog here. Anyway, you mention above about the “Latte Factor,” otherwise known as cutting out a cup of java a day. It actually does make a difference over time. There is a book called “The Automatic Millionaire” that discusses the Latte Factor. The name of the book is cheesy, but the content is excellent. The Latte Factor is only one of the many excellent frugal ideas in this book. I read it about 5 years ago and it changed my life. I too went business school and got my MBA (2002) and graduated with lots of debt. Now I’m debt free (except my mortage) and credit this book with lots of excellent tips.